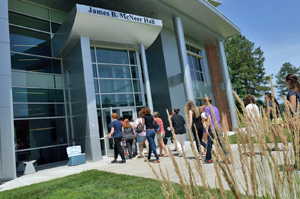 Richard Bland College offers many challenging courses and programs that will provide you with a solid foundation in the liberal arts as you begin or continue your pursuit of higher education. By attending Richard Bland College and completing the Associate Degree, you will have completed the first two years toward the Baccalaureate Degree. We have guaranteed transfer agreements with four-year colleges and universities across the Commonwealth that will enhance your educational opportunities. Richard Bland College of William & Mary is the only two-year residential college in Virginia. The residence halls were built in 2008 and offer apartment-style living with state-of-the-art amenities. Students are able to live and eat affordably starting at just $9,840 per year ranging up to $11,640 per year depending on their room assignment. Faculty members are expected to avoid outside employment if it interferes with their teaching effectiveness and performance of their faculty responsibilities. The primary obligation of full-time faculty members and other employees is to the College. No other form of gainful employment should interfere with this commitment. Persons with full-time teaching appointments who are asked to teach part-time for other institutions, or who wish to engage in consulting or other kinds of paid work, must gain prior written permission from the President or designee on the occasion of first undertaking such work. Faculty members should be aware that provisions of the “State and Local Government Conflict of Interests Act” (VA. Code 2.2-3100 et seq.) may apply to their outside employment or consulting contracts. Ready to Create Your Journey? Deciding where to go to college is a big step, and we're here to help you every step of the way. Connect with us to find out more about Richard Bland College. Copyright © 1996-2019 By Richard Bland College.